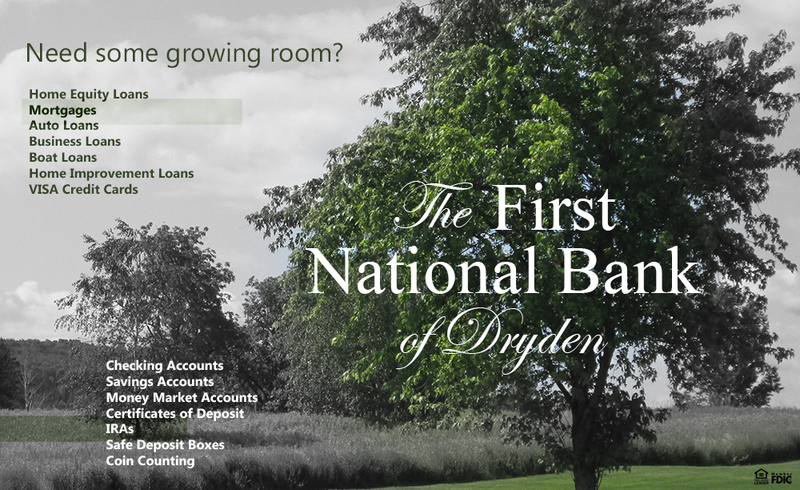 The First National Bank of Dryden – Locally Owned for over 117 years! Locally Owned for over 117 years! Copyright © 2019	FNB of Dryden. In today's fast paced world, you don't always have time to make it to the bank. Our Internet Banking Services, including Bill Pay, give you the convenience of banking from your home or office twenty-four hours a day, seven days a week. Not sure what your visa bill is? Sign up for Visa Statements! You will have the ability to pay and view your visa account with just a few clicks! Check out our latest commercials that appear on Spectrum TV™. You can also view our archive of some of the older commercials. The First National Bank of Dryden would like to welcome you to our user friendly website! The website is responsive and compatible for any tablet or cell phone, so there's no need for an additional app. The structure offers ADA compliance buttons in three locations. These buttons will help our disabled customers to view the website without missing any important content. Feel free to look around and enjoy! Stop by and visit one of our great locations today! Welcome to The First National Bank of Dryden! Find out the ins and outs of identity theft. The First National Bank of Dryden is a member of the Federal Deposit Insurance Company (FDIC). If you want to learn more about the FDIC and deposit insurance, click the FDIC link! What does The First National Bank of Dryden do with your personal information? Copyright © 2019 FNB of Dryden.